At the end of last year, we left our intrepid explorers leaping out of the flying boat in which they had been sleeping, to escape a hungry dire tiger that had decided it wanted a late night snack. Now, dire tigers are a deeply unpleasant thing for adventurers to encounter at the best of times, given that they have armour plating and enhanced claws that give ferocious bonuses to combat. The adventurers were mostly in their night clothes, asleep, and without having had a chance to renew their store of magical backup on which they might ordinarily rely. In a stroke of what I suspect can best be described as luck, I had misplaced the piece of paper in which I had written down the initiative order for the combat, so started the session by asking everyone to roll again, and we would use the new order for better or worse. With the main fighter for the party having been well and truly mauled last time, there was ready agreement, and so the dice were re-rolled. This time the tiger was going to go last in the round. The tactics adopted were generally along the lines of “run away” and “desperately throw anything to hand at it” – but this week, the dice were ever in the party’s favour. As a result, they managed to do a credible amount of damage despite the inauspicious conditions. Being a Kind and Benevolent GM (a statement routinely denied by my players, but we all know the truth really), I ruled that the dire tiger hadn’t got to be such an enormous apex predator by being entirely stupid. It’s sole motivation was one of hunger, and it had succeeded in taking a large bite out of Bumperklart before it was pelted with various produce flame spells, a scorching ray and a variety of crossbow bolts from the animated skeletons that Ruin had stationed near the boat. To the tiger’s mind, there were far easier meals to be had, and so it leapt to the ground and ran off back into the night. A total party-kill situation averted, the group healed up and spent the rest of the night waiting nervously for any more intrusions. With the dawn came a decision to return to the ruins and begin looking for signs of the Emerald Claw expedition. Although the bodies from the previous day’s fight were looking pretty picked over by scavengers, the adventurers opted to take a cautious approach just in case new traps had been set. The barbaric dark elves, with pale tattoos and clothing and equipment made from exotic furs, leathers and beetle carapaces seemed to have all disappeared, but why take chances? The gloom of the massive gallery level took a while to reveal its secrets. Minor magics still lingered, maintaining the integrity of the structure, so there seemed at least to be little danger of collapse, but some of the dark elves did in fact turn out to still be lurking. A group of hunters, returning from several days out in the wilds, ran across them. Assuming the adventurers had been the cause of all the dead bodies in front of the building and, as it turned out, the destruction of the drow village, they attacked. With neither side having the advantage of surprise, the battle was soon over, with the adventurers barely winded. Beyond them, in a maze of wattle and daub huts and tunnels lay the ruined dark elf village. It became obvious that the Emerald Claw had swept through the area, which explained the hostility by the tribe. Soft sounds could be heard from within the wreckage though, so the adventurers decided to see if there were any survivors. Instead they disturbed a large number of dire rats that had been scavenging within the wreckage, and they all came boiling out on the attack. Now, dire rats look awful – take a quick gander at the picture to the left here – and are the size of small dogs. As a result, when a good dozen or so all appeared on the map, the players reacted with fire. Lots of fire. Produce flame spells from the druids were quickly overshadowed by an enormous fireball cast by Darvon, which not only incinerated most of the swarm, but destroyed the remains of the village too. 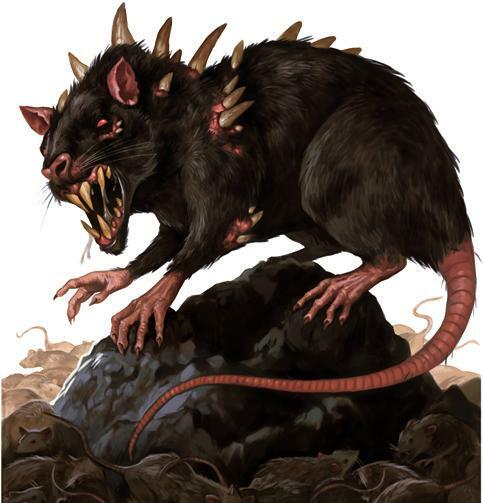 Dire rats are not a particularly dangerous threat for adventurers at the level that the party now is, so this really was an interesting case of a complete overkill – and it led to a discussion that lasted the rest of the session about how they were literally burning through their offensive options at a rate of knots before they’d even found the Emerald Claw troops. With that conversation in mind, they decided to scout around the rest of the gallery level before taking either of the sets of steps rising further up in to the structure. 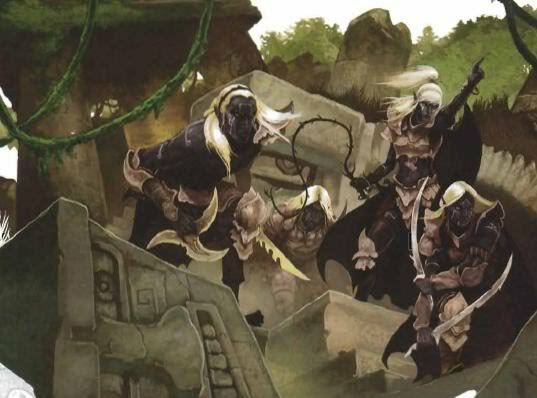 Another set of dark elves saw them coming, but ran before most of the party became aware of them, and it was at that point that a patrol of Karrnathi Skeletons descended one of the sets of stairs to investigate all the noise. These vicious and intelligent undead immediately attacked, but were quickly repelled, with one of them escaping as a result of the cleric’s turning abilities. The afternoon was beginning to draw on, and they reasoned that a rest before pressing on into the structure would be a good idea – so they retreated back to the camp to rest up, which is where we ended the session. I wonder what happened to that lone intelligent undead soldier?